Preston: "Mama you want a spanking? Now you has to go take a time out." Me: "No I wasn't. When?" Preston: "You lied-ed to Daddy. Lying is naughty. Now you has to take a time out." Preston: "Mama I love you." Me: "I love you too." Preston: "I scooted closer to you. Do you want to lay by me too? Mommy is I your hero?" We have been doing a lot of bowling lately. A lot. In the last week alone we have gone three times! First on Monday we went down with our friends Zack and Nathan. And my little sister didn't have school for Martin Luther King day so she came with us. Preston was pretty excited to have Auntie Rissa come too. I let Preston bring cars down with him to entertain the boys when it wasn't their turn and it worked fantastically. The boys did so fantastic that we all headed to McDonalds to have play and have lunch afterwards. Tuesday morning we headed back down for some more bowling. This time we met even more friends! There were six kids bowling this time. Having six small children bowling on the same lane has to be some form of torture for parents. Torture that lasted almost two hours. Most of which I spent attempting to convince Preston that it was his turn and he needed to get up and bowl. Before he finally just said screw bowling I'm here to play cars with my friends and then he did just that, he just didn't exactly phrase it that way. From there we went to Burger King to play and have lunch. Where we may or may not have stayed for three in a half hours. I'm not even kidding. We left the Burger King play area at almost four'o'clock! But oh no that was not the end of bowling. We were back on Saturday! This time we brought Brad and Gigi and Dave. Would you like to see how Preston attempted to spend his time when he wasn't being forced to bowl? That is until he got in trouble and was no longer allowed to play games until he could be a good boy. Which prompted him to bowl one frame very nicely, come over and smile nicely at me, and then ask if he was being a good boy and could could he please play games now. My little con artist. For the record he was told no. 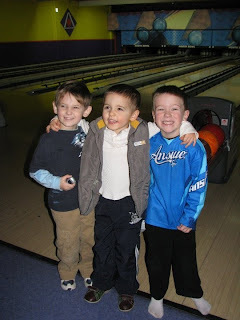 Once the distractions were gone though, Preston actually got a little into bowling. He was ready on his turns and was even willing to help Daddy out too. This time we followed bowling up by going to Gigi's house for dinner and it was delicious! We're becoming regular bowl-a-holics lately. Do you think there is a support group for that? I took the boys to play jump the other day. Preston has been many many times and since before he was even walking! I decided it was time for Mason to check it out too. And both boys had such a blast! Preston already knows which bouncy houses are his favorite and was off and playing right after his shoes came off! Mason was brave enough to go down the big slide all by himself. And to attempt to follow the big boys back up the stairs. Even though he didn't make it, he didn't seem to mind. Preston did take a break from racing around to take Mason down the big slide! I don't know what Mason was more excited about Preston going down the slide with him or just going down the slide in general. And Preston loved being the big cousin showing Mason the ropes. Now we just have to figure out a day to go back. And we will be bringing my sister next time, keeping up with both of them was just exhausting! I've been watching my nephew on Thursdays for the last couple of weeks. Preston is loving it so far because Mason comes over to play at least once a week guaranteed. Of course when you get the two of them together things worth remembering are bound to happen. I was getting ready in the bathroom while Preston and Mason played. I stepped out to see what they were up to just in time to see Preston crash his car into Mason's feet and Mason fall...right at the top of the stairs. I almost had a heart attack! Mason fell so close to the top of the stairs that if he'd been walking a couple of inches over he might have actually fallen DOWN the stairs. When I got over my initial panic, I was furious. Preston got into big trouble and was informed that he absolutely had to be more careful and that baby Mason could have fallen down the stairs and that we have to be more careful around Mason because he is smaller. And that the top of the stairs is dangerous, so we have to be especially more careful there. Then his car got taken away. Preston just sat there and didn't say a word while he got in trouble and then I took Mason into the bathroom with me. Obviously Mason very quickly got bored of me and wanted to get back to Preston. So out of the bathroom we went. Preston was still sitting in the exact same spot and when I walked out I told him again that he had to be careful and that he was Mason's big cousin and it was his job to protect him not hurt him. Then both boys wandered back into the living room to play. I was listening to them when I heard Preston start talking. "Mase...I love you. (Deep sigh)"
Then he started whispering as if he was telling Mason something very important as they walked into the dining room together. He was being so quiet that I had to walk closer and listen very carefully to hear what he was saying. "You gots to be more careful. It's dangerous by the stairs and you coulda gotten hurt Mase. You just gots to be more careful." It was so freaking cute. Preston never tells Mason that he loves him. And I have never heard him give Mason a big cousin to little cousin talking to like that. Especially one that he obviously didn't mean for anyone to overhear. It was their own private talk. Well almost their own private talk since I was eavesdropping. I have a feeling these two are going to be quite the little set of buddies as they get older. It makes me so happy to know that even though Preston doesn't have any siblings right now he's got Mason! Me and Preston decided it was time for another "Mommy and Preston Photo Shoot"! I learned a lovely new trick recently. One that comes in very handy. One that I forgot all about until tonight. I've attempted it twice so far and both times I've had great results. The first was on Christmas. Preston was racing around and hanging out with everyone but me. He was playing games on people's phones, playing with his new toys, and just bouncing around the house. All the while I just wanted a little hug. From my son. You know the one I endured seventeen and a half hours of labor for. But he was just too busy for me. I began to cry. Well fake cry, but I was very believable. Very believable. What can I say I have a talent for the dramatics. Preston instantly snapped to attention and ran over very concerned. "It's otay Mommy. It's otay. I love you. I'll sit with you. Mommy I loooooove you. It's OTAY!" It was hilarious. And so freaking adorable. I had never thought to use fake crying. We used to do it to my littlest sister when she was Preston's age, but I'd forgotten all about it. I was curious as to whether or not this was a one time deal, so I just had to try it out again. We were at my MIL's house and she gave Preston a pack of fruit snacks and it just so happens that I like fruit snacks too, I mean who doesn't. So I very nicely asked him for one. And got shut down. He didn't even think about, it was just an instant no. Obviously Preston likes him some fruit snacks too. And then I started "crying". Preston instantly snapped to attention again. And all of a sudden was more than willing to share his precious fruit snacks. "Mommy, it's otay. Don't cry Mommy. MOMMY! It's otay." Lucky for him Gigi grabbed everyone else a pack so he ended up not having to share his. But it's the fact that he was willing to that counts! Now that I've got this fantastic new ploy up my sleeve Preston better watch out because it really seems to be a winner! I wonder how long I've got before he figures me out. Here's hoping I've got a new one by then! Preston: "I just said a naughty word"
Me: "You did? What'd you say?" Preston: "I not telling you." Preston: "I NOT telling you!" (Thinks about it) "Ohhhhhhh shoot!" Me: (Thinking...WHEW, you've definitely heard and said worse). Put this on repeat over the last few days and you'll see what my days have been like since the Pittsburgh game on Saturday, which in case you were wondering WE WON! We've been doing some bowling lately! We've got a bunch of free games that expire at the end of this month and I'm determined to use them up rather than letting them go to waste! We met Preston's little buddy Boone down there on Friday for a game. The first few frames Preston was into it. Then he remembered the arcade and it was all down hill from there. He kept having to check it out. And I kept having to bring him back for his turn. He did start to get back into it at the end, but that could have been because I'd threatened not to take him for french fries afterwards if he didn't start listening. Preston enjoyed playing at McDonalds afterwards a lot more! He was all over racing around in the tubes with Boone. I was all over being able to sit and talk while Preston played. We're going again tomorrow with more friends so here's hoping that Preston is up for another game! I promised photos of my monkey and his cousins from Christmas and I'm here to deliver! First, look at how cute Miss Madison looked in her Christmas outfit? Seriously I look at that picture and I can hear my uterus screaming that it's time to start trying for a little girl. Then we'll have a perfect pair! I actually managed to capture a good one of Preston and Madison! I was very impressed! Of course I had to promise Preston chocolate to get him to pay attention and hold Madison and sit still long enough to snap a couple of photos. It's rough being three and having a Mommy who wants to take your picture when you have all those brand new Christmas presents to play with! Then we tried to get one of Preston, Mason, and Madison. That didn't go so well. Mason wouldn't look at the camera because he was so fascinated with Madison. Madison was not thrilled about being the object of Mason's attention and was just plain old done being held by someone not that much bigger than her. Preston was just hanging around for the chocolate. I promised Preston one more piece of chocolate and got him to sit still just a little longer so I could snap a photo of him and Mason together. Not bad huh? We're getting better at this! Now I just have to figure out where to put all of these photos up in the house! Sometimes it's rough having a cute son, nephew, and niece...I'm starting to run out of wall space! It has been a while since I last did one of these! I have some serious catching up to do. I hosted a play date today and decided that was the perfect theme for Project Finding Joy. Ready? Okay! Did I just sound a little cheerleader-ish there to you too? 41. Having a completely clean house this morning. 42. Okay, that's a little bit of a lie, my bedroom was definitely not clean. Which is why I'm grateful that we have locks on our doors for the rooms that aren't clean! HA! 43. New friends and old friends and having a chance to get to know each of them better. 44. Listening to Preston play with friends. 45. Preston being old enough to really really enjoy having friends over. 46. Play dates that are more enjoyable than stressful! This is a big one! 47. Watching Preston share his toys. And seeing that he is handling having to share his toys much better than I expected. 48. Friends that stay late. 49. How exhausted Preston is afterwards from having fun and playing hard. 50. A playroom that is trashed! I take that as the sign of a successful play date and that all TWELVE of the kids must have had fun! We have a lot of snow around these parts and if the weather reports are right we're going to be getting even more. Ugh. I am not a fan of snow. Not in the slightest. I hate driving in it, hate how cold it is, and hate how not long after it falls it's dirty and gross. No thank you. I thought Preston shared my feelings. When we got the first batch of snow in November Preston wasn't all that interested. He didn't mind that it was on the ground for several days before he went out to play in it. Or that when he did finally go out to play in it that he was back inside within fifteen minutes. It was cold people. This time around, Preston was pretty excited about the snow. All of a sudden Preston wanted to go out and play. I'm sure it helped that Brad had just gotten home and was shoveling outside. Preston couldn't get into his snow clothes fast enough. And once he was out there he wasted no time playing! Not too much later, Preston got cold and wanted to come inside. Imagine that, getting cold in the snow! I'm sure it didn't help that we still haven't gotten around to buying him real snow gloves so he was out there in those little fabric ones. Two pairs of fabric gloves, just in case you were thinking I was neglectful or something. Ha! Of course though after I took his coat, snow pants, boots, gloves, and hat off Preston was ready to get dressed all over again and head back out. No big deal, it's not like putting all of his snow stuff on is a process or anything. Of course the quiet while Preston was outside playing was well worth getting him dressed again, so he headed back out to play some more. This time with new dry gloves. Two pairs of new dry gloves in fact, just in case you all were thinking child abuse or something. And this time Preston even made a snow angel, two snow angels actually. Then it was time to come inside again. Looks like I'm going to have to get him some real gloves before we get all the snow that's supposed to be on it's way. Wouldn't want to keep my little monster from making any more snow angels!